There are plenty of games in Google Play these days, but I sometimes feel like developers forget to code in the fun. Games are supposed to be fun, right? 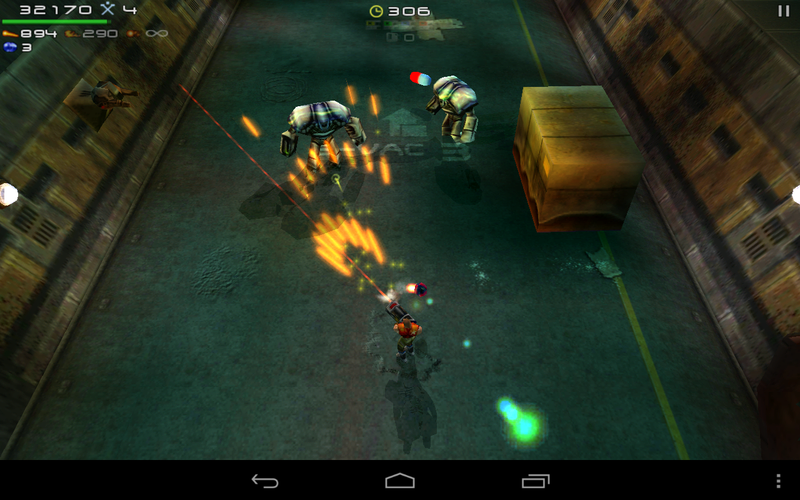 And what's more fun than shooting anything and everything in your path with a rapidly rotating assortment of weapons? Not much, if you ask me. With that in mind, Expendable: Rearmed has a lot of potential. This is a port of a classic top-down arcade shooter from the Dreamcast, and it is all about destruction. I am told there is a backstory to Expendable: Rearmed, but try as I might, I can't think of any reason to care about it. All you really need to know is that humans are the good guys, and the bio-mechanical aliens are the bad guys. You take control of a series of expendable cloned super-soldiers to clear out the alien hordes and protect human colonies. One thing Expendable: Rearmed gets absolutely right is the level design. It's somewhat open in that you can follow various paths, find caches of weapons and power ups, and battle enemies just for the fun of it. The levels are not so expansive that you get lost trying to find your way to the end, though. 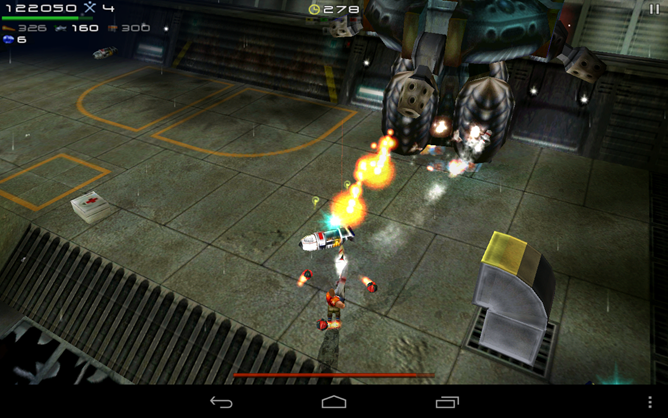 Your main objective is to blast your way to the end of each stage, and beat various boss creatures. Along the way you'll have to locate keycards to pass into new areas. If the old keycard hunt sounds tedious, don't worry. 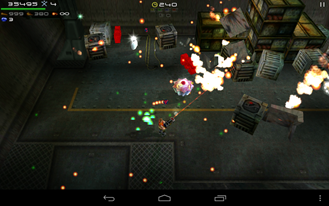 In Expendable: Rearmed you will find the keys by blowing everything up. In fact, that's the main gameplay mechanic. Also keep an eye out of human hostages which you can save, or kill (which the game emphatically reminds you is a "mercy killing"). There are a ton of crates, barrels, and boxes throughout the levels. Shooting them not only produces cool secondary explosions, but drops a ton of weapons, ammo, and occasionally keycards. 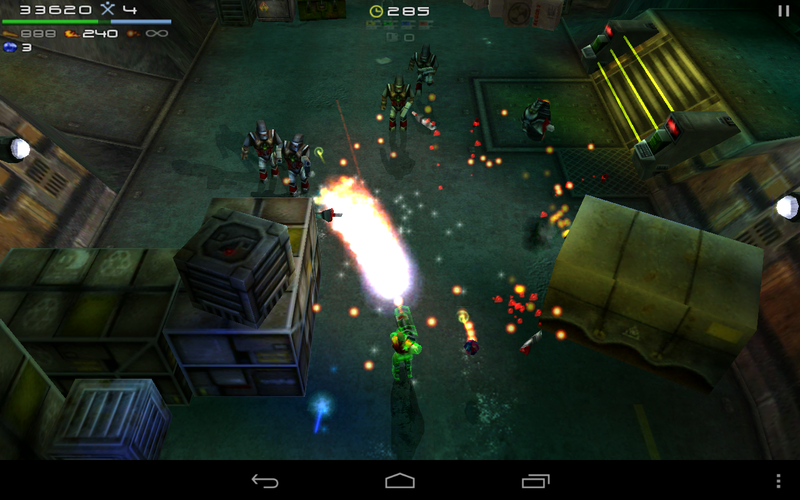 You'll find all sorts of miniguns, energy weapons, missile launchers, flamethrowers and more. Ammo is incredibly plentiful, so feel free to keep shooting. The game would get old quick if you had to worry about how many dozens of missiles were left in your impossibly small gun. 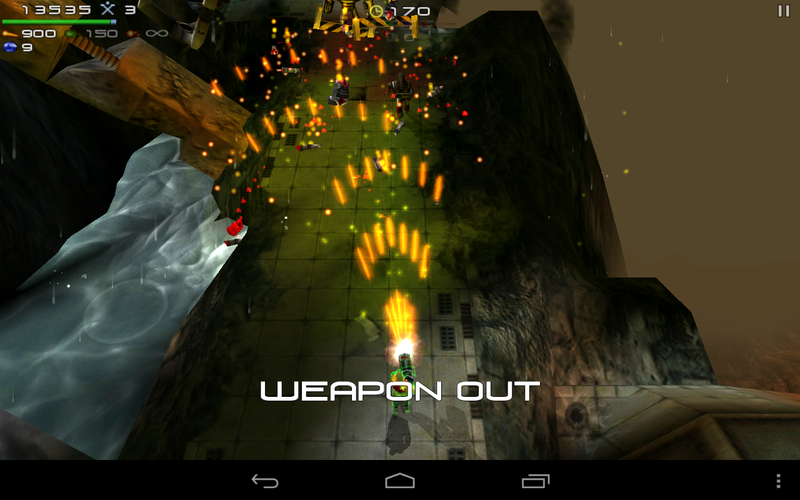 Expendable: Rearmed relies on our old friend the dual analog sticks. Although, this title does not actually display the outlines of virtual sticks, the controls are the same. Drag on the left side of the screen to control movement, and do the same on the right side to fire your weapon in 360-degrees. The controls work well in general, but there are a few sticking points. Even with the sensitivity cranked up, I feel like the movement isn't responsive enough. Similarly, the weapon controls are not fine enough. It is common to under or over-aim and miss the target completely. I actually find myself guiding my avatar around to sweep the field of fire over units rather than actually changing the angle of fire. The way the camera works with the controls is also troublesome. 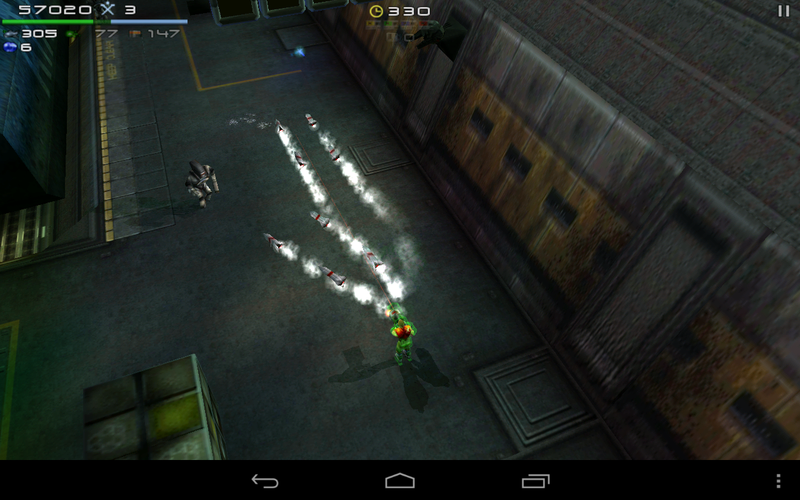 As you meander through tunnels and highly-explosive warehouses, the camera angle will change in certain spots. Most games are very forgiving with reorienting the controls to the new direction. Not Expendable: Rearmed. As soon as the camera changes, so do the controls. You'll be walking along, then the camera direction changes as you enter a new room and you're suddenly walking the other way. I don't want to give the impression I hate the controls. They work, but none of it is as tight as it should be. 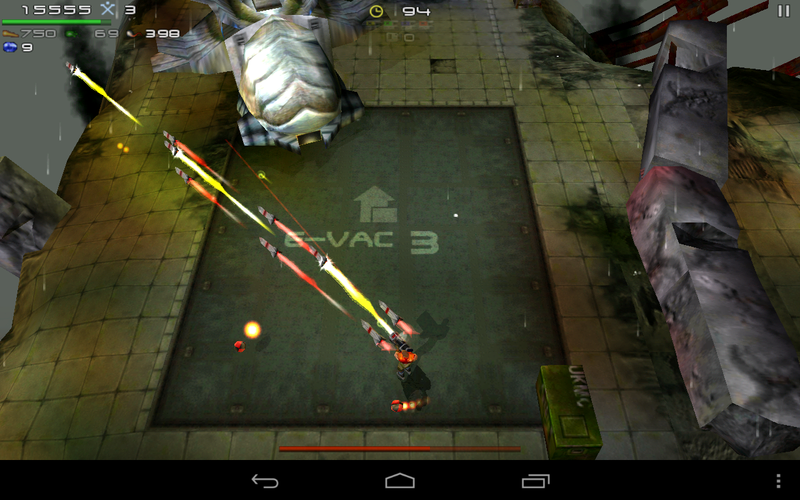 Luckily, the huge ammo caches and large hit boxes make the game very forgiving. Your aim doesn't have to be perfect. 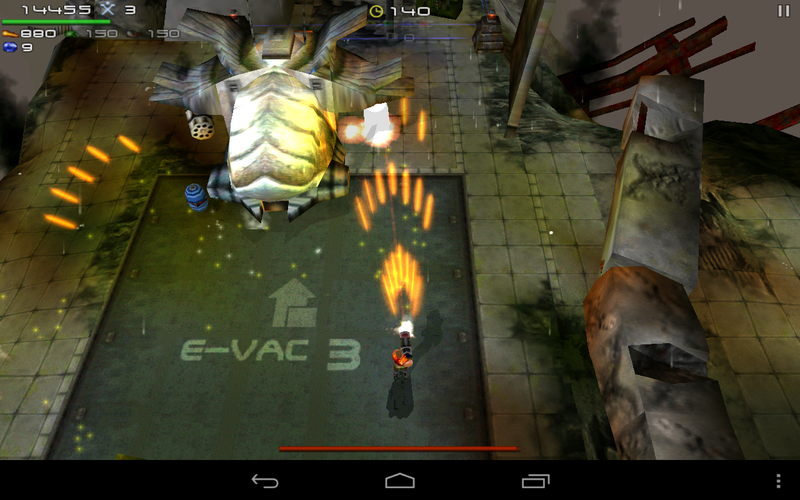 Some parts of Expendable: Rearmed look a little simple, but the graphics are very good overall. Some objects that ought to be rounded are essentially a series of polygons. You have to keep in mind that this is a game heavy on explosions that obscure the battlefield anyway. There are occasional cut scenes that use the in-game engine zoomed in, and they don't look great -- it looks better at normal viewing distance. The texture resolution is actually quite good, and there is no aliasing that I can see. 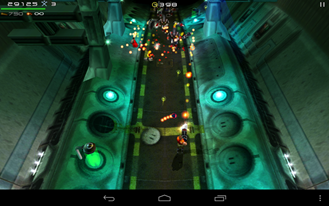 Expendable: Rearmed is compatible with all Android devices, but the graphics are enhanced on Tegra chips. 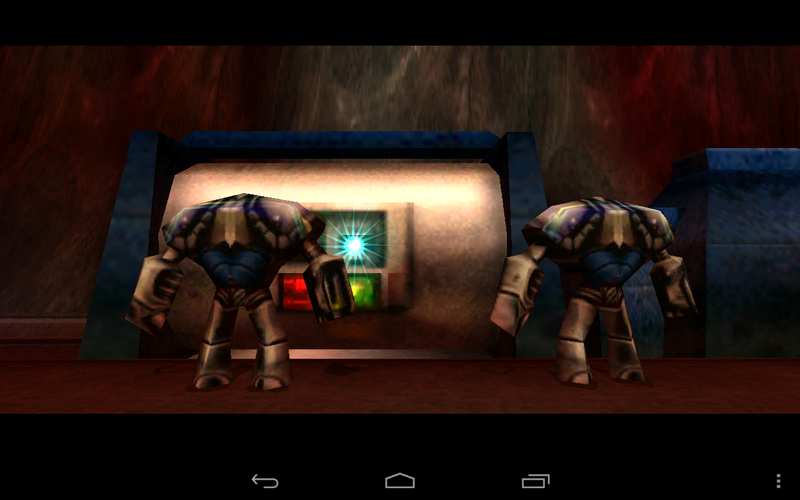 I played the game on a Nexus 7, and the lighting effects really made it look great. The explosions and shadows give it a much more impressive feel. 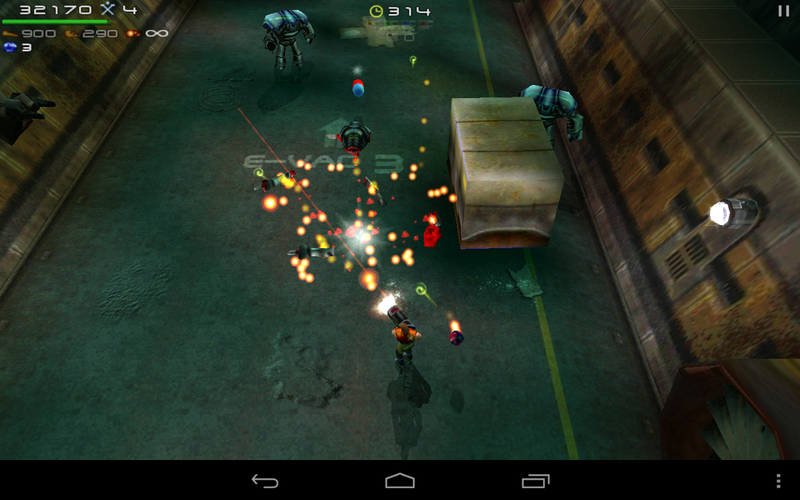 Even when dealing with cascading explosions all over the screen, I saw no noticeable frame rate drops. Expendable: Rearmed is a good game. It's not the kind of experience that's going to stick with you long term, but it is undeniably fun to play. I'm constantly thinking I'll just blast through one more stage when I should be doing other things because it's so easy to pick up. The $3 price tag seems about right, but players looking for a more cerebral experience might find it lacking. This is a solid shooter that doesn't require you to memorize maps or solve a bunch of puzzles. Just open fire and enjoy.